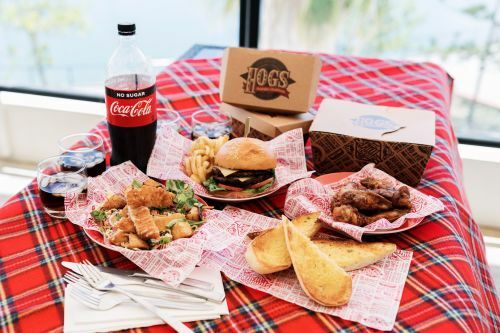 Hogs Breath Cafe - Gladstone uses their own specialised couriers to deliver their food. 200g Sirloin, 150g pork loin, 250g hickory wings, garlic bread, bacon and egg. With a choice of 1 side, 1 sauce and a 390ml soft drink. Choose four wraps and receive a 1.25L bottle of coke. Masterfully slow cooked for maximum tenderness, this succulent lamb is served with piping hot sweet potato mash and beer gravy.